No. 4 Virginia (21-2, 9-2 ACC) earned a 69-61 win over No. 8 North Carolina (19-5, 9-2) in a pick 'em game at Chapel Hill to end a three-game slide against the spread. The Cavs outscored the Heels 23-8 in the final nine minutes, including a questionable call that went against UNC. No. 4 Virginia (21-2, 9-2 ACC) earned [a 69-61 win over No. 8 North Carolina](http://www.espn.com/mens-college-basketball/game?gameId=401082774) (19-5, 9-2) in [what closed as a pick 'em game](https://www.betchicago.com/college-basketball-betting-lines-odds-predictions-virginia-kansas-big-monday) at Chapel Hill to end [a three-game slide against the spread](http://www.vegasinsider.com/college-basketball/teams/team-page.cfm/team/virginia). The Cavs are 17-6 ATS, which is tied with Ole Miss for [the sixth best](https://www.teamrankings.com/ncb/trends/ats_trends/) cover percentage in the country, while Carolina is 14-7-3 ATS. 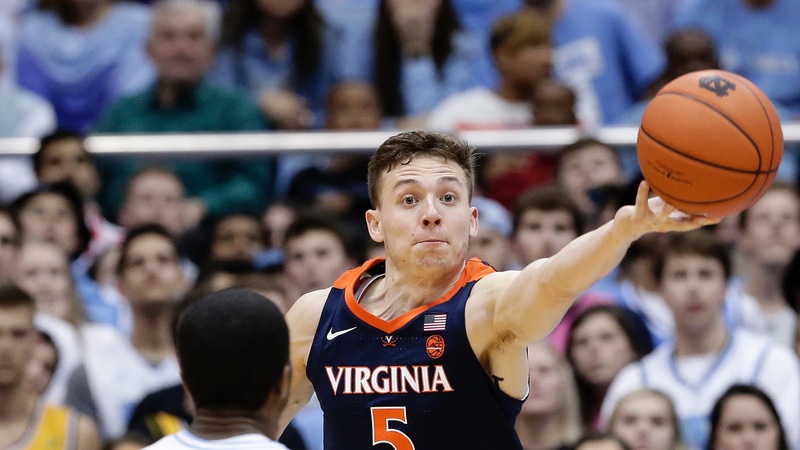 ## Virginia-North Carolina betting recap Virginia outscored the Heels 23-8 in the final nine minutes, so we can't call the outcome a [#badbeat](https://www.betchicago.com/college-basketball-bad-beats), but there was a questionable call that went against UNC and changed momentum. Carolina had possession with the game tied and the shot clock dwindling. Freshman point guard Coby White heaved up a shot from well beyond the 3-point line when he noticed the clock was running down, and he nailed it (despite head coach Roy Williams hanging his head in agony behind him). But, upon review, it was ruled the ball was still in White's hands when the shot clock ran out. You be the judge... <a href="https://twitter.com/jackfrank_jjf/status/1095136046839324672" class="embedly-card" data-card-width="100%" data-card-controls="0">Embedded content: https://twitter.com/jackfrank_jjf/status/1095136046839324672</a> __MORE:__ [Glaring weakness for each of the top-16 seeds](https://www.betchicago.com/ncaa-tournament-2019-odds-top-16-seeds-weakness-duke-virginia-gonzaga) | [Cinderella watch](https://www.betchicago.com/ncaa-tournament-2019-cinderella-ats-bracket-busting-teams-selection-sunday) The basket would've given Carolina a 62-59 lead with 3:29 to play. Instead, the Cavs scored the next five points, while the Heels made only one of their next 11 shots to end the game. The late offensive futility was rough for OVER 139.5 bettors, as North Carolina shot only 35 percent from the field against the notoriously tough Virginia D, which uncharacteristically allowed Duke to shoot 62 percent from 3-point range in [Saturday's 81-71 loss](https://www.betchicago.com/saturday-college-basketball-betting-recap-michigan-revenge-wisconsin) to the Blue Devils. The Cavs also missed eight free throws, three after the White shot that didn't count, to help UNDER bettors' cause. ## Big 12 betting recap The only other games Monday involving Power 5 teams were both in the Big 12. [Baylor beat visiting Oklahoma, 59-53](http://www.espn.com/mens-college-basketball/game?gameId=401083394), but the Bears closed as 6-point favorites, so that was a PUSH unless you got it earlier in the day (the line opened Baylor -4 and [kept going up throughout the afternoon](http://www.vegasinsider.com/college-basketball/odds/las-vegas/line-movement/oklahoma-@-baylor.cfm/date/2-11-19/time/2100#J)). The Bears had beaten the Sooners in Oklahoma by 30 points a couple weeks ago. Oklahoma, at 16-7-2, is still among the country's best ATS. No. 14 Kansas, a 2.5-point underdog at most books, blew a 12-point lead at TCU with a little more than nine minutes to play, but regrouped for [an 82-77 win in overtime](http://www.espn.com/mens-college-basketball/game?gameId=401083523). The Jayhawks are 2-6 SU and ATS on the road. __PLAY:__ Our free [College Hoops 3-Pointer: Spreads and Totals contest](https://betchicago.chalkline.com/games/college-hoops-pick-3-spreads-totals). Correctly pick three college basketball games on Tuesday's slate ATS and their total for a chance to win a BetChicago prize pack.